The Norlake -20°C Upright Lab Freezer provides you with everyday laboratory freezer storage in a reliable upright instrument. This lab freezer has a temperature range of between -10°C to -20°C, features an auto defrost, and uses forced air circulation for uniform temperature distribution. This 20.3 cu ft general purpose freezer has an easy to clean interior with bright lighting for ease of use, and adjustable temperature control. The Norlake General Purpose freezer features foamed in place insulation of CFC free high-density polyurethane foam, adjustable leveling legs and adjustable shelving. 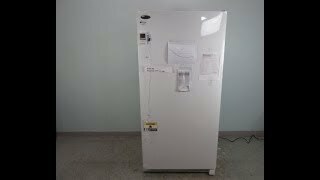 Unit is a brand new scratch & dent freezer with a slight dent in the door. This Norlake -20°C Lab Freezer CAT# 89368-308 is a brand new scratch & dent freezer with a slight dent in the door. This lab freezer comes with a current temperature validation report and a clean bill of health. All of our lab equipment comes backed with our standard warranty. Should you have any questions about this or any of our other Lab Freezers, please don't hesitate to contact us.